This tribute is shared in honor of Samatha Surban (1/17/2006-2/10/2017). We would like to honor her special spirit, strength and love for music. Sam spent time consistently participating in Music Therapy sessions while receiving treatment at UCLA Mattel Children’s Hospital. Sam LOVED music and was absolutely determined to learn guitar and master some of her favorite songs. 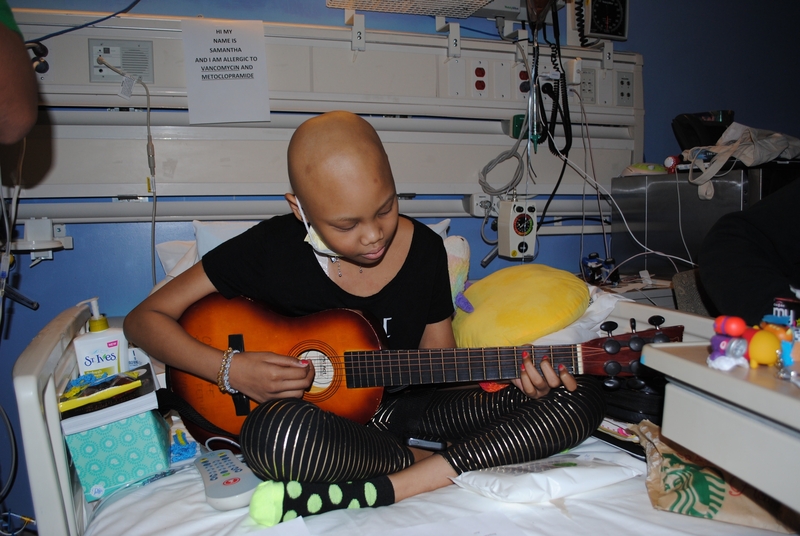 Sam received Music Therapy visits 1-3 times per week while she stayed on the Bone Marrow Transplant and Pediatric Oncology Unit at UCLA Mattel Children’s Hospital. Her constant determination and resilience was inspiring to all. Even when Sam wasn’t feeling well, she always seemed to tap into a reserve of will power and energy when it came to the music. She would sit up with a smile and reach for her guitar, no matter what. Sam inspired her mother to learn to play the ukulele and often times inspired other UCLA Mattel staff members to partake in Music Therapy sessions or encouraged them to dust off their old musical instruments at home and start playing again. Samantha’s kind spirit, inner resources and strength inspired all whom crossed paths with her. During Music Therapy sessions, Sam continued to learn new techniques on the guitar, belted out songs at the top of her lungs, played music with her family members and created relaxing music while playing meditation instruments and practicing deep breathing. Music was a source of focus for Sam that helped to transport her to a place of comfort and creativity. It became something for her to lean on and a way to connect to her inner self with during trying times. Sam’s passion and enthusiasm for music was always magical and contagious. She reminded many people that music can serve as a source of support. When I think of Sam, I think of many songs, especially “Fight Song” by Rachel Platten and “Can’t Blame a Girl for Trying” by Sabrina Carpenter. We will never forget Sam’s openness, resilience, creativity, kindness, sense of humor and determination. As you sing today or play an instrument today, think of Sam!